A warning here. US Baby Boomers and older might find this documentary series difficult to watch. I mentioned Ken Burns Vietnam to a Vietnam vet. Then I remembered my flashback while watching the doc. It was 1967. I was 12 serving as an altar boy at the funeral of a soldier killed in Vietnam. My fellow altar boy that day was a real tough guy – who cried throughout the service. The dead soldier was his cousin. 50 years later, I still felt the need to reach out and comfort. So while watching the documentary I found him on Facebook and friended him. This is brilliant storytelling and filmmaking. It also connects us to what is happening today. Although I have lived and studied The Vietnam War over the years, there were many things I either forgot or didn’t know. 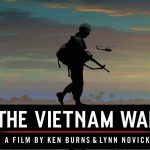 Ken Burns gives us new stories of Americans and Vietnamese who lived and lost during the war. Keep in mind today Vietnam is economically growing and an ally of the United States. Another memory scene. The late 1960s and early 1970s were scary times. There was domestic violence and an economic decline on the way. As badly divided as we seem now, it is nowhere near what it was back then. The violence and hatred among political groups and ethnic groups seemed more physical and personal. Maybe today’s social media is allowing us to vent our anger at a distance rather than physically up close. But so far we have not had the assassination of politicians nor the gunning down of college students on campuses while protesting. Vietnam Lesson 1: It became apparent to many American advisors and journalists that the defeat in Vietnam was inevitable early when Buddhist monks started setting themselves on fire. That extreme act of rebellion said “I am willing to sacrifice my life to get the invader out of my country.” The invader was France first then the United States followed by China and the Soviet Union. 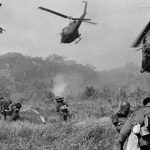 Vietnam Lesson 2: The American public will rebel, revolt, or change politically only when government threatens their lives or the lives of their family and loved ones. 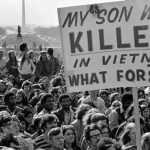 Opposition to the war only turned when a majority of Americans realized that they were sacrificing their sons and daughters for a ridiculous war. Vietnam Lesson 3: The news media at the time confirmed what most Americans were suspecting. TV News reports from the frontlines were the first glimpse. The Pentagon Papers sealed it. We then understood that we were sacrificing for an ally that was incompetent and covered up by two presidents who lied to us to attempt to keep themselves in power. The world is changing dramatically today due to aging and new technology that is upsetting the status quo. But if you are looking for a change in the American psyche and attitude, remember it won’t happen until we see, not suspect, that our government has put our lives in actual danger. Until then, a near majority of lawmakers and citizens will stay mum. Sadly, like in the 1960s, we need to see or feel the disaster before we respond. So how do you watch this 18 hour documentary miniseries? You can still watch it on demand. Check with your local PBS station through your cable or satellite provider. Here’s how I did it. I viewed the 18 hours in 3 or 4 hour chunks. And remember, I’m a glutton for the stuff. Logistically, try watching during downtime holidays since most of the regular TV series are on hiatus until mid-January or February. However, if you want holidays of good cheer, this might not be the right TV watching time. If you have watched it, give me your takes.